Staying healthy and feeling your best is important at any age, but it’s especially important for seniors. Studies have shown that being active as we age is crucial for physical, mental and emotional health. Do you have elderly parents who could use a little encouragement when it comes to staying active and engaged? Here are five pieces of sage advice to help get them out, about and enjoying life. Encourage them to lend a helping hand: Volunteer opportunities, depending on your parent’s skills and mobility, are a great way for them to stay active and engaged. Libraries, schools, museums, hospitals, soup kitchens, and animal shelters are just a few organizations that are always in need of volunteers. Volunteering also could help your parents feel connected to the community. And in turn, this feeling of value brings many mental and physical benefits. Give them the resources to stay occupied while at home: Many elderly people spend all day alone in a silent house, without company or entertainment. While you might not always be with your parents during the day, you can help keep them occupied with activities such as audiobooks, CDs, radio shows, puzzles, hobbies, and anything else you think they might enjoy during the times you are not there. 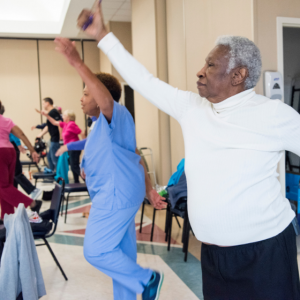 Keep them moving: Local park districts and senior centers offer exercise groups tailored to older adults. These classes, group walks, and special outings encourage daily exercise. And, they not only provide physical activity but also foster friendships. Get them a furry friend: If your loved one can handle the care and financial responsibilities associated with owning a pet, a new animal companion like a cat or dog, could be a great addition to their household. There are thousands of animals in local animal shelters looking for their forever home and getting a furry for your parents could provide the sense of purpose, responsibility and love your aging family member needs. Keep them social: Help your aging parents stay connected to other family members, neighbors, and friends. Help them set up social events and activities that include inviting people to visit them at their home, as well as those that give them opportunities to go out and see others. There are many ways to keep an elderly parent active and engaged. But if the challenge is getting them to their social activities and making certain they’re safe during their planned events, we can help. Our Companion Care Services provide a wide range of solutions to help keep your aging loved one active, engaged and enjoying life. Contact FirstLight Home Care today to see how we can help.